When it comes to snacks, especially for my kids lunches, I tend to focus on the healthy stuff. Snack food that I can send to school with them knowing that it will fill them up, and keep them going – so they don’t come home completely starving at the end of the day. Those things that will also give them a good dose of nutrition, but that they still love to eat. But…sometimes you also just need a great treat. You really do. 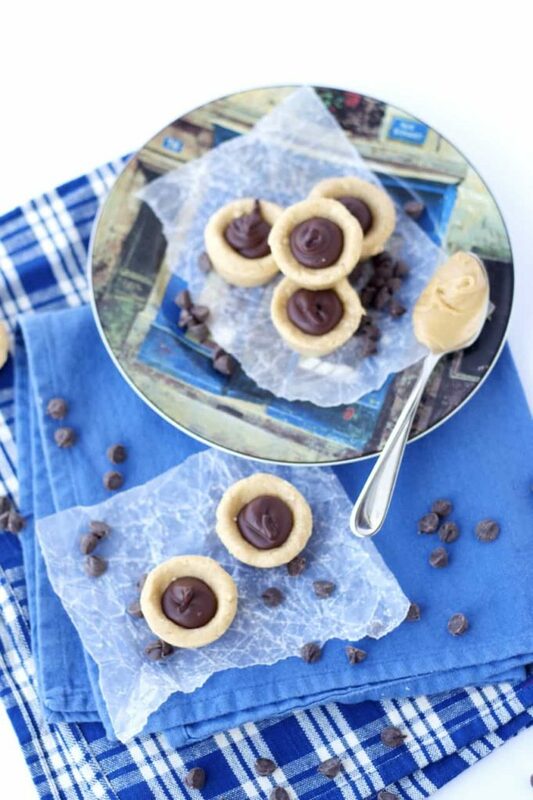 These no bake peanut butter cookie cups are exactly that. And the kids went wild for them. As did I – if I’m completely honest, I kind of didn’t want to share! Plus, they’re no bake and they’re flourless. With some oatmeal added in so that they’re a little more hearty then your typical cookie. Without the flour added in, you essentially get an inside out Reese’s peanut butter cup. And I am all about the peanut butter cups. These taste a lot like them, with a rich peanut buttery flavour in the cookie cup and topped with just the right amount of chocolate. Also, I had some leftover melted chocolate and peanut butter after filling up the little cookie cups, so I coated some pretzels with it. I would highly recommend this for any leftover chocolate you may have! Actually I may be making a version of just that some time soon because they were really good! Now I’m certainly not going to tell you these are healthy. They’re not. There’s butter and sugar and chocolate in them. But everyone needs a treat now and then, and these are mini, which in my opinion makes them even better! Mini treats are great, you can have a treat without going crazy. These are perfect as you get your treat, but they’re rich enough that one is enough. Everyone needs a treat like that occasionally I think! 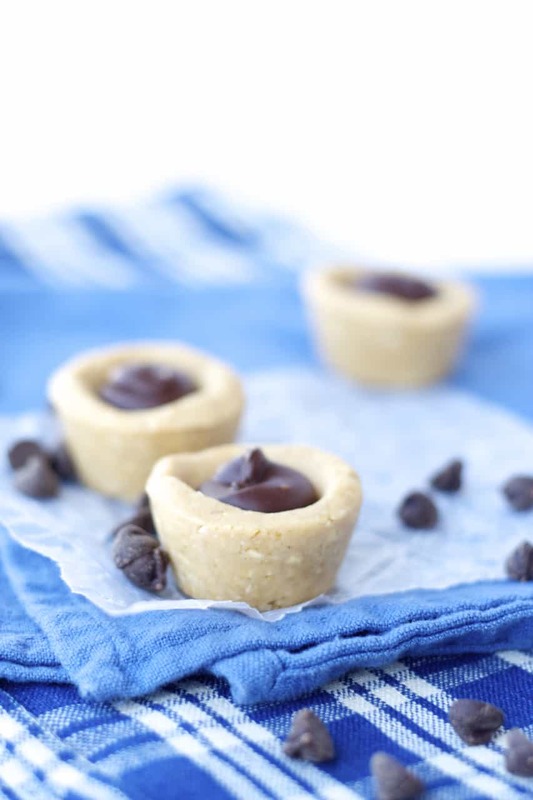 I also shared this no bake peanut butter cookie cup recipe over at Food Fanatic, so make sure to check it out over there as well! Sorry about that Rosemary, I will get that fixed in the ingredients. It should be 2 tablespoons of peanut butter melted with the chocolate chips. Thanks for letting me know! Oh my gosh these are sooo adorable! I can so see myself devouring the whole batch. 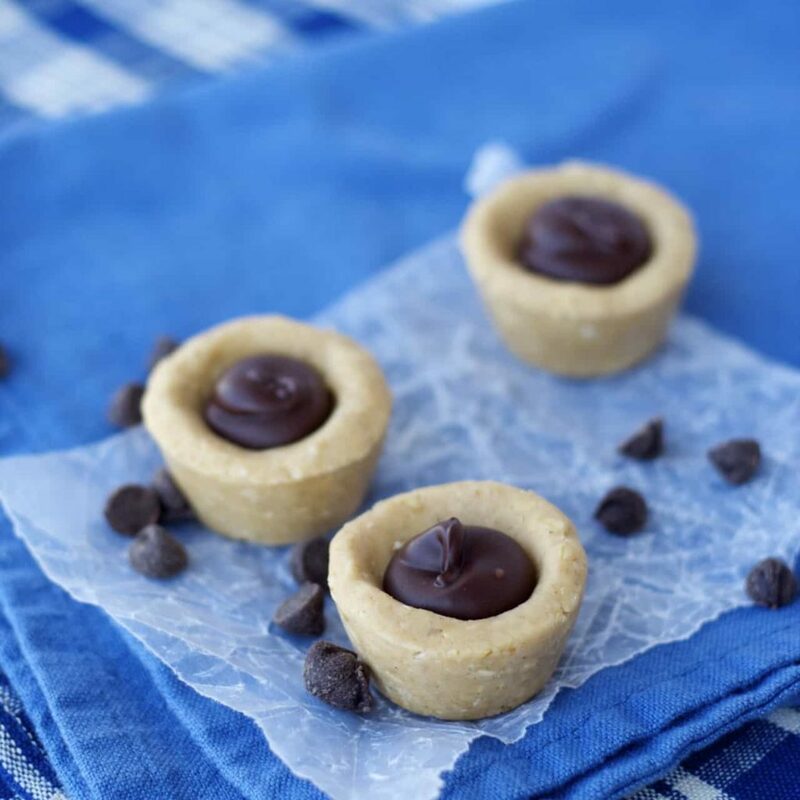 What a beautiful recipe for the most perfect cookie cups ever! Love them! These look unreal! Melt in your mouth delicious! Peanut butter and chocolate PLUS no-bake! Hello new favorite dessert...yum! You KNOW I'm gonna love these, Stacey! I need a treat MUCH more often than "occasionally," so how about one of these per hour? Well, if I'm being honest, so do I! I just try to make it occasionally! :) Thanks Mir! That is always the problem with peanut butter and chocolate....stopping! Thanks Sophia! What an awesome idea! Love that these are no bake! haha I am allll about the peanut butter cups too! These look fantastic! And I love how few ingredients it takes to make them! You really just can't go wrong with peanut butter and chocolate! Thanks Ashley! 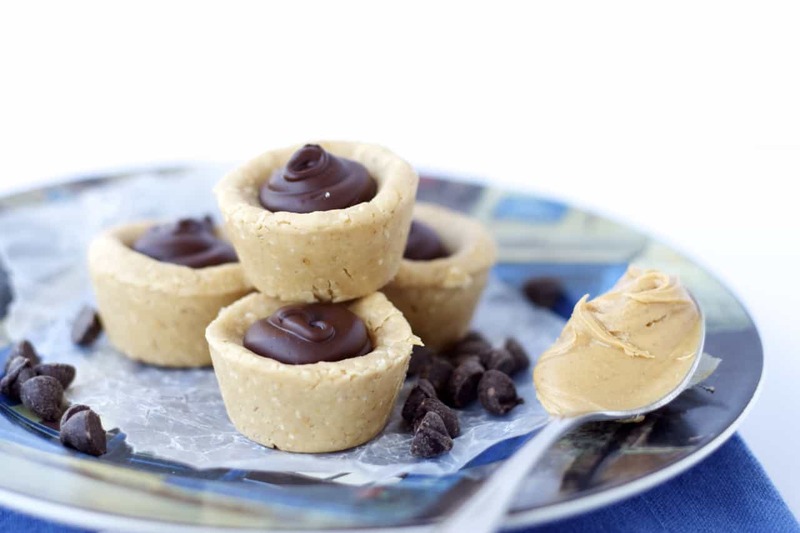 These Peanut butter mini cups are so cute and delicious! No-bake sounds divine! I am always on board with peanut butter cups for dinner! That sounds like a great plan! Thanks Cheyanne! I agree....mini desserts are the perfect way to indulge without over indulging!! Or at the very least, it makes it easier to not over indulge! As long as you can eat just one! :) Thanks Meg! These are so cute, Stacey! Chocolate and peanut butter are the best combo! Love that they are no bake! I seriously never get sick of chocolate and peanut butter, such an amazing combo! Thanks Kelly! these are so adorable Stacey! bonus that they are no bake! Mini food is just plain fun hey? Thanks Manali! No bake IS appealing, especially in the summer right?! Thanks Mira! These look AMAZING! Definitely something I'd devour! No bake and peanut butter? I am sold!! This look so good! No-bake AND flourless?! These are a must. Pinned! These cookie cups are adorable! Plus they are no bake! That is amazing- so easy! Your kids are out of school in a week? We still have a month left! Thanks Cyndi, hope they like them! I love that these are no bake! My kids can even try making them this summer.